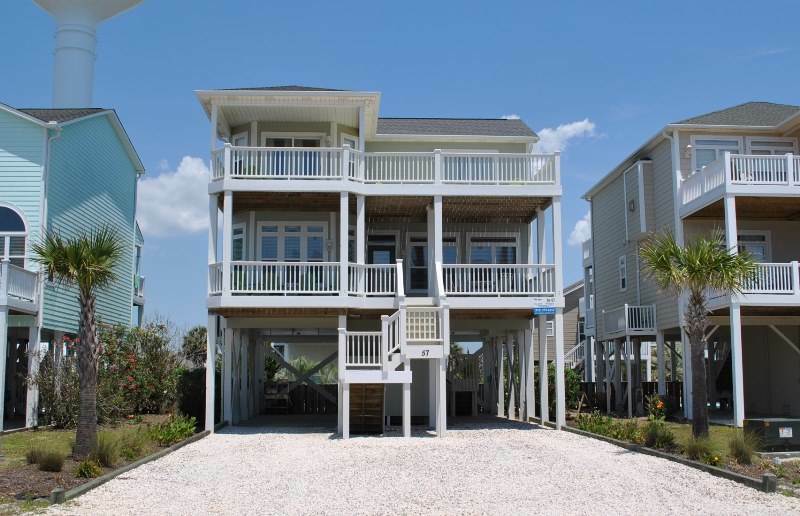 Come enjoy our immaculate, upscale second row beach home located just east of the pier on Ocean Isle Beach. Two beach access points and the community center are less than 200 yards away (three minute walk). Enjoy a 5-10 minute walk to museums, playgrounds, miniature golf, the ice cream shop, restaurants and bars. The house has a traditional floor plan, with the main living area and two bedrooms on the first floor, and three bedrooms on the second. First floor bedrooms each contain queen beds. The second floor master bedroom has a king bed, a bedroom with 2 queen beds and one with 2 full/twin bunk bed sets. Relax and watch the sun rise over the water as you eat breakfast on the lower deck, equipped with Adirondack chairs and a table that seats four. The upper deck is partially covered with ocean views and Adirondack chairs to soak in some sun or relax with a good book. The beach is wide and open with stupendous views, where you can sunbathe, people watch, join in a game of volleyball or hunt for sea shells. The island is also bicycle friendly with plenty of places to rent if you don’t have room to bring your own. For a change of pace from the sea and sand, enjoy the private pool in the back, or take a dip in the hot tub to relax your muscles and refresh your mind. Hibiscus, lantana and mini palm trees surround the pool area. An outdoor shower and dressing area is adjacent to the pool. Inside, this beautifully decorated home has an open floor plan, with original artwork throughout. The kitchen, foyer, dining room and living room are connected, with a large flat-screen TV with DVD player in the living area. Light streams through the front of the house making this area bright and inviting. The kitchen is well-equipped with stainless steel appliances and blender for island-inspired drinks. The dining area seats ten between the dining room table and breakfast bar, which can also be used for buffet-style service. A charcoal grill is provided for outdoor cooking. The spa can be heated for an additional $75/day (Jan - Mar) and $50 (April May & Sept). Guest shall notify Sloane if they require heat - heated spa water overflows into the pool. We went down to the beach in southern NC for a family vacation. We picked Ocean Isle Beach because some of us are from Florida and others around DC. There were 10 of us on this trip. We stopped in Wilmington on the way down and enjoyed a meal on the water in the historic part of town. The weather was great as we gathered in Ocean Isle Beach. We were happy to see that we had a view of the beach from the deck and bedrooms upstairs. There was a lot of activity near the public buildings and beach access, but it was quiet just a few blocks down from there where we were. Be sure to bring bikes if you go because there are plenty of places to bike to and very little traffic. The house itself was very clean and had everything we needed. We ate very well between the fresh fish available nearby and the fruit and vegetable stands just outside of town. The rooms were quiet and having separate bathrooms for each room made it very pleasant. We used the pool quite a bit because it was HOT, esp. in the afternoon. The pool is very private behind a fence and bushes. There is a back stairway that leads directly to the pool. The house is built such that the first floor is upstairs like most of the other houses there in case of storms, so there is plenty of parking underneath. We took a lot of walks on the beach because you can walk 2-3 miles in either direction. Sunset Beach nearby was rated a top 10 beach in the U.S. last year and this one is very similar. It is very wide and you can swim out quite a ways. That's about it. If I had one complaint it's that we couldn't stay longer, we hope to get back next year!